October 24, 2014 — Downtown Alameda Business Assn. As reported in the media earlier this month, a fellow Park Street Business Association member lost his business in the arson fires just before it had a chance to get off the ground. Saboor Zafari, the owner of Angela’s Restaurant, has been a generous supporter of Alameda non-profit organizations as well as the community at large for many years. Now he needs our help! 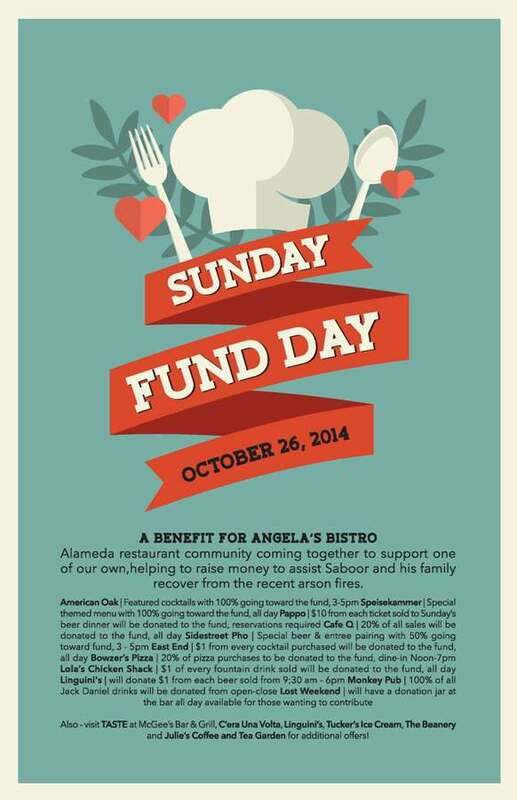 Sunday Fund Day is a fundraiser to help re-establish Angela’s Restaurant and bring the community together. It takes place in Alameda’s historic downtown district on Sunday, October 26. Saboor Zafari was close to opening the new Angela’s Restaurant when the business was destroyed by a devastating arsonist fire. “My partner and I went through a similar situation two years ago and I was astounded at the damage that a fire could do. I know from experience that the road to recovery is a long one. Because of the uncertainties that lie ahead for Angela’s, this event is intended to help Saboor and his family cover any immediate costs while the waiting game gets off to a start,” remarked event organizer Melanie Hartman of American Oak. A number of restaurants and lounges found in Downtown Alameda’s Historic Park Street District will each be offering special menu items on Sunday, October 26, of which the proceeds will help Saboor replace all that was lost in the fire. Please help get the word out and plan to attend Sunday Fund Day. More restaurants are pitching in every day. Please check with your favorite eateries to see if they have any special items or activities planned for Sunday Fund Day. You might even consider making Sunday a true “Fund Day” by strolling through the district and ordering special dishes and/or drinks from a number of establishments. Thank you for supporting a local business and helping to re-establish Angela’s Restaurant! The merchants in Downtown Alameda’s Park Street Business District are always proud to assist in the educational enrichment of our local students. On Wednesday, November 5, more than 15 businesses will be joining together to donate a portion of their sales income to the Alameda Education Foundation’s Adopt A Classroom program. AEF will be directing funds raised on November 5 to classrooms not yet adopted and whose teachers demonstrate the most need. The goal is to collectively raise $2,000 during the day – enough to fund four classrooms in need.